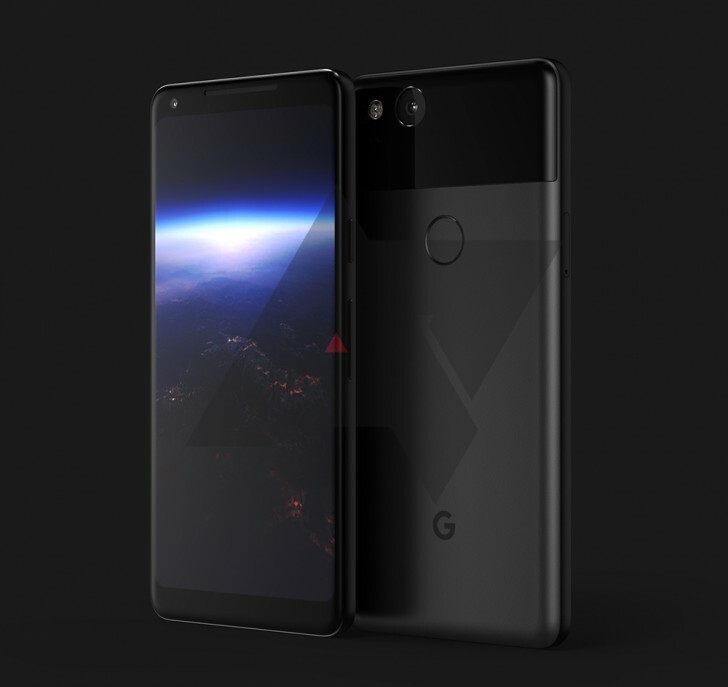 Android Police has an early render of the upcoming Google Pixel 2, which will be manufactured by LG. The render in question is of the bigger or "XL" model and all details mentioned pertain only to this particular variant. At first glance the phone looks similar to the current Google Pixel XL but there are many differences to consider. On the front is an 18:9 aspect ratio AMOLED display. It is expected the display will be 6.0-inch in size. The glass has curved edges but this is not a curved display. Like the G6 and the S8, the phone has very narrow bezels on the front but isn't quite bezel-less like the Essential Phone or Mi MIX. On the back the new phone has a glass area near the top but it's much smaller this time around. There is a single camera lens at the top with LED flash and the fingerprint sensor is placed outside the glass area this time. The phone has no visible antenna lines in the render. The headphone jack is not visible in these shots but that doesn't confirm its presence or absence. The phone will also have squeeze functionality similar to the HTC U11's Edge Sense. This will let you squeeze the phone from sides and access functions, such as Google Assistant. Android Police does reiterate that this is not the final design and some things could change between now and the release date later this year. Also, this might not apply to the smaller model, which could have a different design. For more information, check out the Android Police post below. Pixel 1 made by HTC,now Pixel 2 will be made by LG,what's next?Who will make Pixel 3 next year?Not Sam or Sony,I recon..Maybe they should hire Xiaomi,latest hardware,best software and looks something like Mix..how about that? Looks stunning. Cant wait to see the HTC smaller Pixel 2. LG and Google are using HTC squeeze technology. I can see practicalities in that function. The back is more refined. As light texture it with a matt finish would top it off nicely.